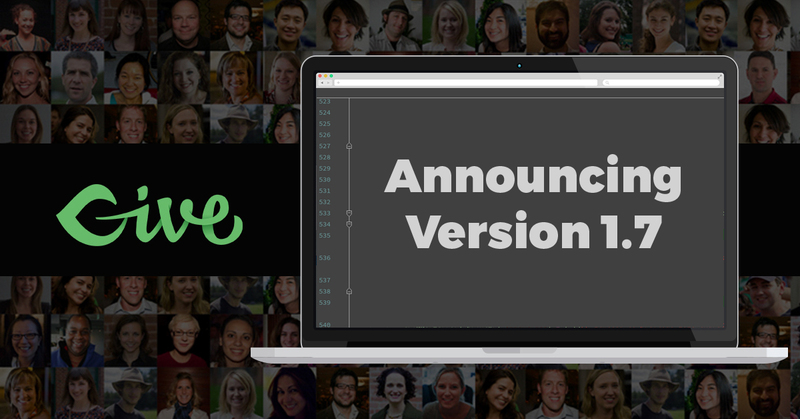 Give Version 1.7 is Here! Give Version 1.7 has been released and has some nice features and improvements that you’ll want to add to your site right away. Besides those, there’s been a lot of work “under the hood” to make this a really stable and reliable release. We’ve been working hard on looking toward coding with the longterm future of Give in mind. We want to make sure that in the years to come our code can power whatever your website throws at it. That means a lot of improved and smarter functions, classes, fallbacks, better inline docs for developers, more consistent internationalization, better accessibility, and more. Button only mode — launch a Give form from one button. Importable Sample Data — this makes testing Give much easier for users and developers alike. This might potentially be powered by the Give CLI from Give 1.7. Revamping our Forms API — this will make manipulating the layout and positioning of all our form fields, legends, inputs, and triggers much easier from a development perspective.